The lesson begins with one of the most routinely misused Scriptures regarding the Sabbath—not in terms of inaccurately quoting the verse, but in regards to quoting the verse without acknowledging the surrounding context. Begin reading the account in Mark 2 starting with verse 23. What were the disciples doing in verse 23? Did the Pharisees accuse the disciples of breaking the Sabbath? What happened to the man who gathered firewood on the Sabbath (Num 15:32-36)? What OT descriptions of the Sabbath Law would make it acceptable for men to walk through a field and pluck wheat to nibble on during a Sabbath afternoon stroll? Did Jesus correct the Pharisees and say that the disciples were only breaking a man-made Law about the Sabbath? Jesus compared the behavior of the disciples to behavior of David’s that was unlawful. Why do you think Jesus would compare a lawful Sabbath activity for a Jew to an unlawful act by a Jew? Wouldn’t it make more sense to be comparing one unlawful act to another? In case you struggled with any of those questions, allow me to explain. The disciples were plucking grain while they walked. The Pharisees accused the disciples of breaking the Sabbath and, by extension, accused Jesus of promoting sin. There is no explanation of the Sabbath in the entire Old Testament that would make the behavior of the disciples an “acceptable Sabbath activity”. Nor did Jesus claim that they were only breaking a man-made rule about the Sabbath, and Jesus wasn’t shy about calling out the traditions of the Pharisees that contradicted Scripture. Jesus compared the disciples breaking the Sabbath with David breaking a ceremonial law regarding the Tabernacle. Jesus did this because the Sabbath is a ceremonial law that pointed to Christ. This brings us to the memory verse statement. Jesus doesn’t say that He is Lord of the Sabbath as a means of stressing the ongoing importance of Sabbath observance. 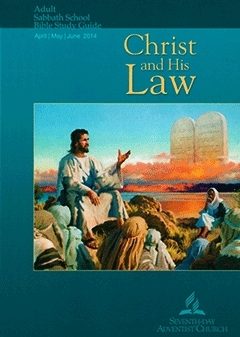 Jesus said that He is Lord of the Sabbath in explaining why His disciples were not bound by the Sabbath Law. Instead of being the cornerstone to defend Sabbath keeping by the New Testament Church, this verse is pivotal in understanding that Christ’s followers are not bound by the Sabbath Law. The lesson proceeds to distort history. There is no evidence that all Christians observed the Sabbath until a century after Christ’s death. What we find is that there is clear evidence that people who learned the Christian faith directly from the disciples were no longer observing the Sabbath. The first recorded history we have of Christian churches does not include regular Sabbath observance-although there is evidence that small pockets of followers, likely those with strong Jewish roots, did continue their Jewish observances and that this practice was acceptable to other Christians. The true history is vastly different than the way that is portrayed in this lesson. This lesson should also give every SDA second thoughts about source of Ellen White’s vision. This lesson admits, because there is simply too much historical evidence to dispute, that Christians were worshipping together on Sunday long before Constantine. Somehow, Ellen White was mistaken on this, and many other “facts”, in her inspired writings. God inspires truth, not error. This is more piece of evidence that Ellen White’s inspiration did not come from God. The lesson discusses God resting on the 7th day. Did God begin working again on the 8th day? Does Genesis 2 discuss Adam and Eve also resting on the 7th day? God stopped His work of creation at the end of the 6th day. The ceasing (Sabbath) was different from the weekly Sabbath given later to the nation of Israel. Without sin entering the world, the original Sabbath would have been forever. Working was part of the curse of sin (Gen 3:19). How is your personal experience a valid indicator of whether a doctrine is true or false? The lesson is correct to point out that the Sabbath is a symbol that pointed to Christ. What happened to the other symbols from the Old Testament that point to Christ, now that He has come, died on the Cross, and been resurrected? The sacrifice was a symbol of Christ, what happened to it? The priesthood, and particularly the High Priest, was a symbol of Christ, and what became of it? The temple was a symbol of Christ, and what became of it? The feast days of the Old Testament were symbols of Christ, and what became of them? Why would the seventh-day Sabbath be the one symbol of Christ from the Old Testament that continued on after Christ’s resurrection and ascension? Contrary to what the lesson claims it was not “still Paul’s “custom” to attend a synagogue on the Sabbath (Acts 17:2)”to worship with other believers. Paul was attending a Jewish gathering in order to witness to his fellow countrymen about Christ. Paul’s “custom” was about witnessing, not about worshipping! Read the remaining verses cited and list even one where a gathering of believers to worship together is being described. You can’t, because there aren't any. The verses ALL describe the process of witnessing to Jews (and those Gentiles who already gathered with the Jews) at the place where they gathered. There is not a single mention of New Testament Believers worshipping together on the Sabbath. Instead, Believers are described as meeting daily (Acts 2:42-47) or specifically gathering together on the first day (Acts 20:7). The number of laws regarding the Sabbath that were in place at the time of Christ is a red herring. It has nothing to do with the content of the passage. Jesus didn’t claim that they were only breaking a man-made rule about the Sabbath, and Jesus wasn’t shy about calling out the traditions of the Pharisees that contradicted Scripture. (see Mark 7:1-13 for instance). Jesus compared the disciples breaking the Sabbath with David breaking a ceremonial law regarding the Tabernacle. Jesus did this because the Sabbath is a ceremonial law that pointed to Christ. Please list all of the healings performed by Jesus that would be considered “necessary” medical procedures at an SDA hospital and would be acceptable to perform on the Sabbath. I’ll bet that you couldn’t find one. Notice in John 5:17, when Jesus is accused of breaking the Sabbath He does not defend Himself by claiming that what He is doing is not work. Instead He defends Himself as being the Son of God and doing the same thing that God the Father does, continues His work every single day of the week. The Sabbath Law does not forbid God from working, and that is the “right to work” that Jesus claimed. He said that because He was the Son of God (and the Lord of the Sabbath) that He was free to do His work on the Sabbath day. Yet again, SDAs turn to Ellen White quotes as part of their “Bible Study”. Ellen White is a part of every study that Adventist do. Sometimes it is blatant, like including the quote right after the list of Bible passages. Other times it is more subtle. But one can not participate in an SDA Church published “Bible” study without being inundated by Ellen White’s concepts and words. Every SDA is influenced by these, even when they don’t admit it to themselves. Over the past couple of months, multiple friends and family on Facebook have posted an article on why they go to church on Saturday. The article is introduced as a piece intended to create greater tolerance and understanding when in fact it is nothing more than an apologetic for the requirement of 7th day Sabbath observance. There is a Biblical rationale for promoting tolerance towards those with different worship styles and even different worship days. Everyone does not understand their dietary and worship freedoms in the same way, and Paul admonishes us to be tolerant of those differences. Rom 14:1-9 As for the one who is weak in faith, welcome him, but not to quarrel over opinions. One person believes he may eat anything, while the weak person eats only vegetables. Let not the one who eats despise the one who abstains, and let not the one who abstains pass judgment on the one who eats, for God has welcomed him. Who are you to pass judgment on the servant of another? It is before his own master that he stands or falls. And he will be upheld, for the Lord is able to make him stand. One person esteems one day as better than another, while another esteems all days alike. Each one should be fully convinced in his own mind. The one who observes the day, observes it in honor of the Lord. The one who eats, eats in honor of the Lord, since he gives thanks to God, while the one who abstains, abstains in honor of the Lord and gives thanks to God. For none of us lives to himself, and none of us dies to himself. For if we live, we live to the Lord, and if we die, we die to the Lord. So then, whether we live or whether we die, we are the Lord's. For to this end Christ died and lived again, that he might be Lord both of the dead and of the living. I do not begrudge my SDA friends and family the ability to gather for worship on the Sabbath day. I do take issue; however, with SDA doctrinal teachings (like those in the link being so widely promoted) that Sabbath worship is a requirement for believers. Therefore, I would like to take this opportunity to explain why I don’t worship on the Sabbath. I’d like to begin by acknowledging one of the points that SDAs are correct in pointing out; the Sabbath of the Ten Commandments is the 7th day Sabbath. There is no Scriptural basis indicating that the day of Sabbath observance was changed from the 7th day to the 1st of the week. So if I have acknowledged this central point of the Adventist argument, why don’t I observe the Sabbath of the Ten Commandments? This requires examining the nature of the Law in the Old Testament. The distinction between the 10 commandments spoken to the people and written directly by God, and the remaining commandments given through Moses is given greater emphasis by SDAs than is found in Scripture. When we look to the Scriptural account, we learn that the reason some commandments were given directly to the people and others were given through Moses is that the people didn’t want to hear anymore from God. Ex 20:18-21 Now when all the people saw the thunder and the flashes of lightning and the sound of the trumpet and the mountain smoking, the people were afraid and trembled, and they stood far off and said to Moses, “You speak to us, and we will listen; but do not let God speak to us, lest we die.” Moses said to the people, “Do not fear, for God has come to test you, that the fear of him may be before you, that you may not sin.” The people stood far off, while Moses drew near to the thick darkness where God was. The primary purpose of the Law (Ten Commandments and Mosaic Law) was to lead the people to the Promised Messiah. Gal 3:23-24 Now before faith came, we were held captive under the law, imprisoned until the coming faith would be revealed. So then, the law was our guardian until Christ came, in order that we might be justified by faith. Ultimately, all of the OT was about leading people to the Messiah. John 5: 39 You search the Scriptures because you think that in them you have eternal life; and it is they that bear witness about me and 5:46 For if you believed Moses, you would believe me; for he wrote of me. The law pointed out our hopeless sinfulness, and our need for God’s mercy found in the Messiah. Rom 3:19-20 Now we know that whatever the law says it speaks to those who are under the law, so that every mouth may be stopped, and the whole world may be held accountable to God. For by works of the law no human being will be justified in his sight, since through the law comes knowledge of sin. The law foretold the role and nature of the Messiah. Luke 24:27 And beginning with Moses and all the Prophets, he interpreted to them in all the Scriptures the things concerning himself. The book of Hebrews tells us a great deal about how OT laws foretold Christ and were fulfilled by Christ. Christ fulfilled the High Priesthood (Chapters 5-7). Christ fulfilled the need to offer sacrifices (7:25-28), He fulfilled the entire temple ministry (8:1-7). All of these laws foretold Christ and were fulfilled in Christ. The requirement to keep these laws ended, there was no “spirit” or “principle” of the Law that continued. These laws had served their purpose. Interestingly, Hebrews also discusses the Sabbath. Hebrews 4:9-11 So then, there remains a Sabbath rest for the people of God, for whoever has entered God's rest has also rested from his works as God did from his. Let us therefore strive to enter that rest, so that no one may fall by the same sort of disobedience. If we were to read only those verses in Hebrews 4, the Sabbath command would appear to be something that is affirmed as continuing from the Old Testament Law, rather than being something fulfilled in Christ. This illustrates the problem of reading an isolated snippet without the surrounding passages. Let’s back up just a few verses and see what is really being said about the Sabbath rest. Heb 4:6-8 Since therefore it remains for some to enter it, and those who formerly received the good news failed to enter because of disobedience, again he appoints a certain day, “Today,” saying through David so long afterward, in the words already quoted “Today, if you hear his voice, do not harden your hearts.” For if Joshua had given them rest, God would not have spoken of another day later on. The Jews, despite rigorously observing the 7th day Sabbath, did not enter God’s rest. The rest being discussed here is not merely refraining from working for a specific 24 hour period. At one point, God appointed a specific day, the 7th, as a day of rest. We see in this passage that “again he appoints a certain day”. We have a new establishment of Sabbath taking place, and what day does this verse say it is? Is it the 7th day? Has it been changed to the 1st day? Neither; the day that has been appointed is “Today”. We can enter the true Sabbath rest of God any day. And that rest isn’t a 24 hour rest, it is the ongoing ceasing of our works just like God ceased his work of creation (see Heb 4:3-4) on the 7th day. God didn’t start working at finishing creation after sunset the 7th day; His rest was ongoing. That “rest” is what man was created for before sin entered the world, and that “rest” is what is restored to us through the reconciliation found in Christ. The Sabbath command was a shadow of Christ and the reconciliation that occurs through Christ. The yearly, monthly, and weekly Sabbath foretold Christ, they were a shadow of the real meaning, just as sacrifices, priests, and the temple services were a shadow of the real meaning. Now that the Light of the World has arrived, we no longer live in these shadows. Every time in the New Testament that the Apostles are described as meeting with someone on the Sabbath, it is attended with a group of non-believers in order to present the Gospel of Jesus Christ. There is no mention of New Testament Believers worshipping together on the Sabbath. Instead, Believers are described as meeting daily (Acts 2:42-47) or specifically gathering together on the first day (Acts 20:7). The Old Testament command to rest on the 7th day has not been changed to a principle of resting 1 day in 7. It has not been transferred to resting on the 1st day of the week. Nor has the command continued unchanged. The Sabbath command was a shadow that pointed to Christ which has been fulfilled in Him. The Sabbath rest that remains is a superior rest in every way, it is not a rest that we partake in once per week, it is a rest that we enter into once and remain eternally. Copyright 2014 BibleStudiesForAdventists.com. All rights reserved. Revised April 25, 2014. This website is published by Life Assurance Ministries, Camp Verde, Arizona, USA, the publisher of Proclamation! Magazine. Contact email: BibleStudiesForAdventists@gmail.com.